Former FBI Deputy Director Andrew McCabe is only willing to testify before Congress if he gets a temporary “use immunity” from prosecution, says his lawyer in a letter to the Senate judiciary committee, obtained by CNN. “Under the terms of such a grant of use immunity, no testimony or other information provided by Mr. McCabe could be used against him in a criminal case,” lawyer Michael Bromwich wrote, according to CNN. The committee’s chair, Sen. Chuck Grassley (R-Iowa), asked McCabe to testify next week about the Justice Department inspector general’s (IG) report on how the FBI handled its investigation of Hillary Clinton. Grassley has also, according to CNN sources, invited former FBI Director James Comey and former Attorney General Loretta Lynch to testify. It’s not clear what their response was. McCabe led a small team assigned to the Clinton investigation probing her mishandling of classified information. He was fired in March, only a day from eligibility for a government pension, after a previous IG report showed he authorized a leak in 2016 to The Wall Street Journal to boost his profile and then lied about it to Comey, his boss at the time, and investigators. 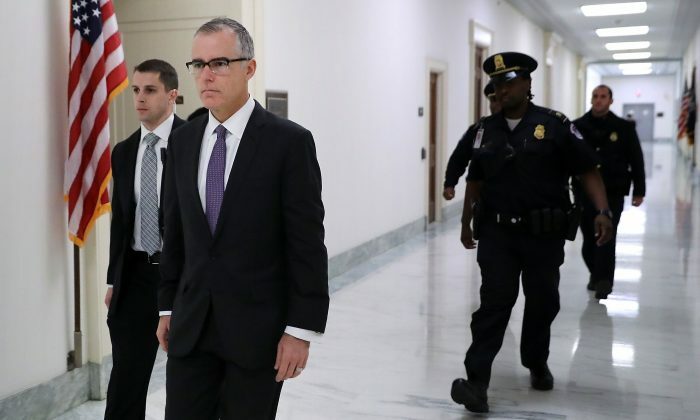 A group of Congress members then referred McCabe for criminal prosecution for repeatedly lying under oath and authorizing a leak in violation of FBI policy. McCabe’s lawyer said he needs the use immunity because his testimony could otherwise be used by prosecutors picking up on the referral. The lawmakers can force him to testify with a subpoena, and if he still refuses, they could issue a contempt resolution and refer him for prosecution to the U.S. Attorney’s Office in Washington. However, that doesn’t explain why he told investigators that he hadn’t authorized the leak and didn’t know who did. The upcoming IG report was expected to be released already. It’s rumored to be a detailed report over 400 pages long that delves into irregularities during the Clinton investigation. Clinton kept classified information on a poorly secured private email server and deleted 30,000 of her emails despite a subpoena, exerting additional effort to make the deletion irreversible. She claimed those were her personal emails, but thousands were later found that contained work-related and classified information. The investigation started in July 2015 and was headed by McCabe since Jan. 29, 2016, when Comey appointed him as deputy director. A few months prior, McCabe’s wife, Jill, received some $675,000 for her Virginia state Senate campaign from two political entities heavily influenced by Clinton associate Gov. Terry McCauliffe, the Journal reported. In September 2016, after McCabe learned that thousands of Clinton emails, including some thought forever lost, were found on the laptop of disgraced former Congressman Anthony Weiner, he sat on the discovery for a month before telling Comey. Comey then, on Oct. 28, 2016, reopened the Clinton investigation, infuriating Democrats less than two weeks before the 2016 election. On Nov. 6, 2016, Comey closed the investigation again—again recommending no charges. McCabe’s leak to the Journal dealt with the FBI investigation of the Clinton Foundation for alleged pay-for-play schemes. “Are you telling me that I need to shut down a validly predicated investigation?” McCabe fired back. McCabe described the conversation as “very dramatic” and told the inspector general’s office that he “never had a similar confrontation” in his entire FBI career. Although he is not named in the IG report, Matthew Axelrod was the principal associate deputy attorney general at the time. Axelrod was fired along with his boss, Deputy Attorney General Sally Yates, shortly after President Donald Trump assumed office. The two senior FBI officials who McCabe had authorized to leak were Strzok and Lisa Page. Text messages sent between Strzok and Page revealed that they were extremely biased against Trump. Strzok was later part of the special counsel probe into allegations of collusion between the Trump campaign and Russia. Strzok was removed when the texts became public. Page quit on May 4. The texts, released in several batches with varying degrees of redaction, also showed that McCabe knew in advance that CNN was about to publish its story regarding the Steele dossier. McCabe also knew CNN’s internal reasoning for running the story and about a leak made to CNN about a closed-door meeting between then-president-elect Trump and Comey, where some content of the dossier was discussed. The Steele dossier was a piece of opposition research put together by former British intelligence agent Christopher Steele. The Clinton campaign and the Democratic National Committee paid opposition research firm Fusion GPS through a law firm to compile the dossier. Fusion GPS hired Steele, who in turn used second- and thirdhand sources close to the Kremlin for the material. Fusion GPS also received money from Russia while Steele worked on the dossier. That dossier was then used by the FBI as the core of a warrant application to the Foreign Intelligence Surveillance Court to spy on Trump campaign volunteer Carter Page and his associates.